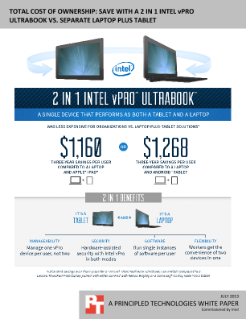 The 2 in 1 Intel® vPro™ technology-based Ultrabook™, a single device that acts as both a tablet and laptop, can be the best and least expensive way for an organization to meet the needs of workers who want a tablet and a laptop. This versatile new class of laptop boasts the sleek design, light weight, impressive performance, and long battery ...life of an Ultrabook™, the enterprise grade manageability of an Intel® Core™ vPro™ processor, and it transforms—by flipping, sliding, folding, swiveling, or splitting—into a tablet. We analyzed three-year costs and value for an organization that is considering purchasing two devices for each staff member—a laptop and either an iPad or an Android tablet—both of which the organization will manage, secure, and support. Our analysis shows that a 2 in 1 Intel vPro technology-based Ultrabook device is a less expensive and more secure alternative for the organization and provides a better tablet experience for users. Read the full Ultrabook™ Convertible TCO and Benefit Analysis White Paper.